Michael graduated in 2007 as one of the most decorated football players in CCH history. He was a 3 year first team WECSSAA All star. In 2007, he was recognized with a WESPY as the best linemen of the year for all levels (CIS, WECSSAA, OFC and OVFL). Mike was also a staple for the Essex Ravens of the OVFL. He was named two-time defensive player of the year for the OVFL and inducted into their hall of fame in 2010. After a very successful High School career, Mike moved on to Boise, Idaho where he played for the Broncos of Boise state. There, Mike was a 3-year starter, won Rookie of the year and was selected to be a 3-time conference all star. After a successful career at Boise (see videos below), Mike moved on to the professional ranks. He was invited to work out with the Detroit Lions, but was hurt and could not fully participate in all events and was cut. One team's loss is another team's gain. Mike was drafted by the Hamilton Tiger-Cats his senior year at Boise, and when things in the NFL didn't pan out, he signed on with the Tiger Cats and is currently in his 4th year with the team. Mike is CCH TOUGH! He has sustained 3 knee injuries, only to bounce back and find his way onto the starting defensive line for the Grey Cup contending Tiger-Cats. Currently, Mike has joined his fellow CCH alumni Daryl Townsend (2003) and Tyrone Crawford (2007) as part of Windsor Finest Football Academy where he runs the D-Line for local area youth football players. Mike Atkinson warming up on the field before the Michigan State - Boise State game on August 31, 2012. Mike anchored the defensive line with 3 solo tackles and 7 assists despite playing on injured ankle that was heavily taped. Mike Atkinson (2007) and several of his CCH friends. 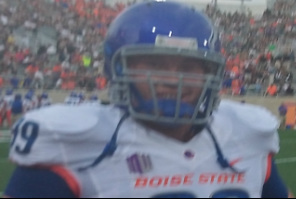 Several CCH alum, teachers and family came out to support Mike at the MSU - Boise game on Aug. 31, 2012. Mike and Tyrone play a game in Ohio and many staff members were in attendance. See if you can pick them out.